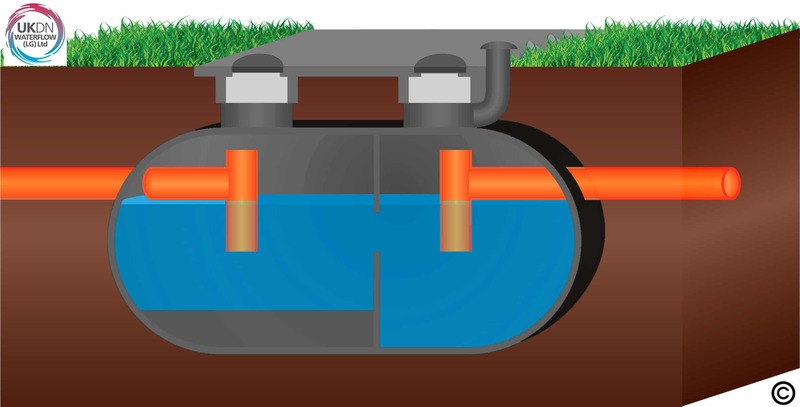 UKDN Waterflow > Advice > What is a Septic Tank? A septic tank collects and treats wastewater at a property that is not connected to the mains sewer system. Installed underground, a septic tank makes use of natural processes to treat the sewage it stores. Usually made up of two chambers or compartments, the tank receives wastewater from an inlet pipe. Wastewater enters the first chamber and separates over time, with solids settling at the bottom, oils and greases forming a layer of scum at the top, and a layer of relatively clear water remaining in the middle. This clarified wastewater enters the second chamber. 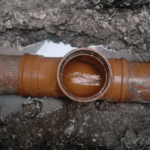 It then exits via an outlet pipe into a septic drain field, also known as a seepage field or leach field. The remaining scum and solids in the tank are broken down by naturally occurring bacteria and what is left should be professionally removed periodically. Septic systems require relatively little maintenance, but septic tank owners need to observe certain rules to make sure the tank system operates effectively. These items will block the inlet and outlet pipes, and also disrupt the biological separation process taking place within the tank itself. The sludge that remains at the bottom of the tank after the natural biological separation process has ocurred, must be removed from the tank by a vacuum truck. This stops it from overflowing into the leach field. How often it needs emptying depends on a range of factors, from the size of the tank to the amount of waste that is added to the tank, and other variables. Some need emptying every couple of years, while others can go for decades before needing to be emptied. Your local specialist will help you plan this service.